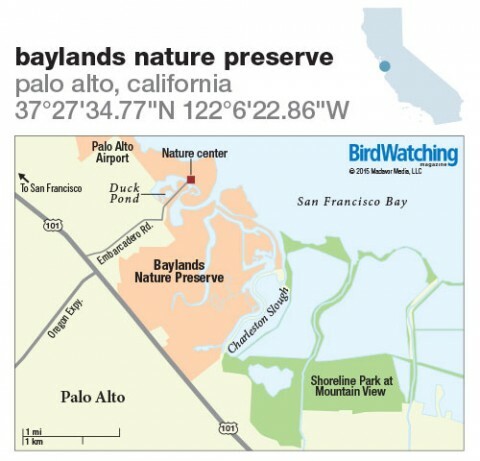 A great place to look for Ridgway’s Rail, avocets, and stilts on San Francisco Bay. Baylands Nature Preserve is one of the largest tracts of undisturbed marshland remaining in the San Francisco Bay region and a favorite year-round spot for birders and photographers. Its 15 miles of multi-use trails provide access to tidal, freshwater, and upland habitats and the birds that depend on them. I’ve been hiking the area for years, and since joining the San Francisco Bay Bird Observatory, my appreciation for the preserve has deepened. The Duck Pond is famous for its wide variety of waterfowl and gulls and is a field-trip site for the observatory’s gull-ID workshops. SFBBO’s citizen-science volunteers have conducted research on American Avocets, Black-necked Stilts, and other waterbirds that nest in the area. The preserve’s common species include Greater and Lesser Scaup, American White Pelican, White-tailed Kite, and Long-billed Curlew. Kristin Butler is a journalist and the outreach and communications director for the San Francisco Bay Bird Observatory. Baylands Nature Preserve covers 1,940 acres of salt marshes and mudflats on San Francisco Bay. From north- or southbound Hwy. 101 in Palo Alto, exit onto Embarcadero Rd. and go east. Drive 1.25 miles and turn right into the parking lot across from the nature center. Start birding at the Duck Pond or along one of the trails. Wetlands — ponds, tidal marsh, sloughs, bay — and upland grasslands. Mostly flat. Gravel levees, wood boardwalk, crushed oyster-shell and decomposed-granite trail bed. Year-round: Gadwall, Cinnamon Teal, Ruddy Duck, Northern Shoveler, Ring-necked Pheasant, Pied-billed Grebe, American White Pelican, Great and Snowy Egrets, Black-crowned Night-Heron, White-tailed Kite, Red-tailed Hawk, Black-necked Stilt, American Avocet, Greater Yellowlegs, Long-billed Curlew, Marbled Godwit, Forster’s Tern, Ridgway’s Rail, Anna’s Hummingbird, Black Phoebe, Marsh Wren, Bushtit, Common Yellowthroat, Song Sparrow. Fall through spring: Dunlin, Least and Western Sandpipers, Bonaparte’s and Glaucous-winged Gulls. Two nature centers, walking and biking trails. Nature walks and programs on ecology and natural history for all age groups offered on weekends throughout the year. Checklist and detailed hotspots map on city website. City preserve. Free and open to the public 8 a.m. to sunset every day. Free parking. Look for Ridgway’s Rail from walkway leading north from interpretive center. Wintering shorebirds often found at low tide in bay behind ecocenter. Bring a spotting scope. 3.1 miles from preserve on Terminal Blvd. Great spot for shorebirds and American White Pelican. About six miles north of preserve at south end of Dumbarton Bridge. One of the best places on the bay for Western Snowy Plover.